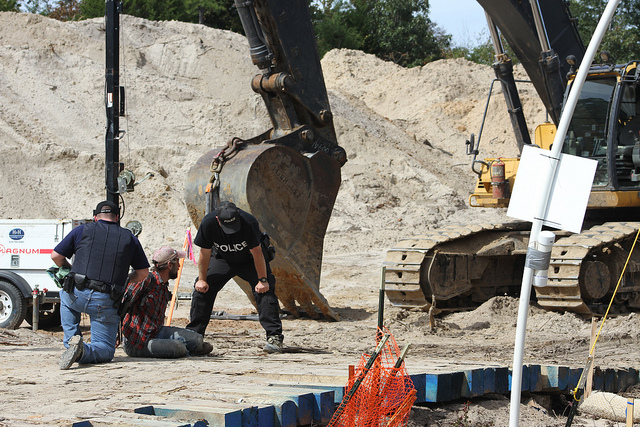 Police arrest and unchain a blockader from a backhoe on the XL construction site. 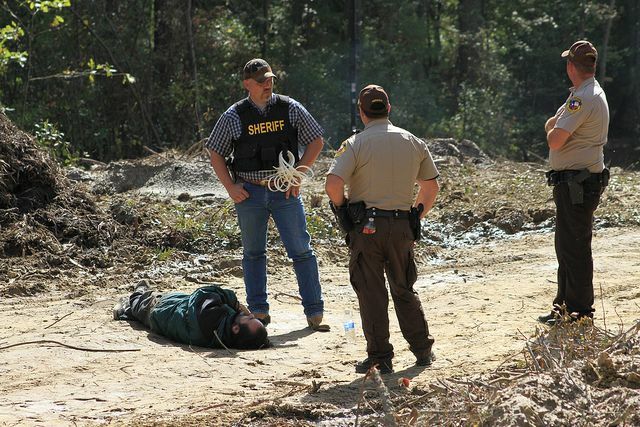 “As the Winnsboro, Texas tree blockade enters its fourth week, over 50 blockaders publicly demonstrated on the Keystone XL easement despite the threat of a newly-expanded Strategic Lawsuit Against Public Participation (SLAPP) by TransCanada and egregious criminal overcharges by local law enforcement. 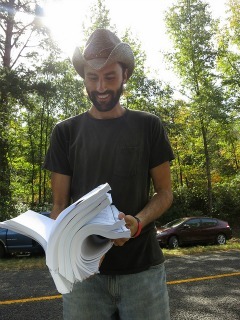 Here’s a photo of our spokesperson, Ron Seifert, holding the stack of legal papers we just got served. SLAPP suits (acronym meaning Strategic Lawsuits Against Public Participation) are specifically designed as tools to use the court system to prevent action of defendants that the plaintiff (the person bringing the suit) find objectionable. Historically SLAPPS have been used by companies or famous individuals to suppress negative press about them or their company. Lately though, corporations that find themselves under attack by civic groups and non-profit public interest organizations have started using SLAPPs in an effort to stop the groups actions. One of the distinguishing features of a SLAPP is that the content of the suit itself usually contains vague language, references to wide spread claims of financial injury, requests for redress in large sums of money and demands for the court to issue injunctions against the defendants to get them to stop their activities. Since free speech is a protected right, the desired outcome of the SLAPP, while loaded with legal claims such as defamation of character, obstruction of free trade, emotional injury or distress, the real objective of the lawsuit is to first intimidate the defendant, especially by requesting monetary damage awards similar to a tort (a suit asking for redress for actual damages through monetary award). The idea is that the suing party (plaintiff) hopes to scare the defendant which large monetary damage requests and complicated legalese. As in the example with the TransCanada XL pipe line protesters, SLAPP filings can be quite large, creating a costly burden for the defense — someone has to read and process all that. Many states outlaw the use of SLAPPs but more conservative judges have demonstrated more sympathy to business interests and less toward citizen action. Some states such as California offer immediate redress against SLAPPs by offering the right to a speedy hearing and the right to demand consideration of dismissal under anti-SLAPP rules. But no matter what state laws or judge’s sympathies may prevail, someone’s time and energy must go into defending against these cases. Many SLAPP suits can continue on repeatedly for years, reflecting the power imbalance of low-fund or no-fund citizen’s groups against the bottomless pit of funds that large trans-national corporations like TransCanada possess. TransCanada’s monetary reserves, like those of many other large corporations challenged by citizen’s groups, an sustain its SLAPP activities for a long time, thus achieving the greater goal of getting the group to give up out of sheer exhaustion of their funds. While many people like to think of non-profit groups as running a tight ground campaign, money runs the wheels in our society and in the case of XL, the money to fight the protests runs deep. On the positive side, protesters have challenged SLAPPs and won not only their day in court, but have had the entire cases thrown out. Currently protesters are in jail and more will be expected to be jailed in this action. Everyone’s help is vital. You can contribute to the costs incurred by those standing on the front line in defense of our environment and public safety. Go to the site and “give a generous donation to their bail fund” and also help to support their continued work and possibly any upcoming court proceedings or even to help with just regular logistics of this vital action. Hog-tied protestor at XL site.